Does Response Rate Impact HCAHPS Scores? Proactive hospitals always strive to improve patient experience, knowing that the best way to obtain this valuable feedback comes directly from patients, relying on surveys to create measurable results to continually improve hospital practices. The Hospital Consumer Assessment of Healthcare Providers and Systems (HCAHPS) survey is one metric used to gain this valuable insight from patients. The key for this prized patient insight is to ensure that a reliable number of patients provide survey feedback. Response rate refers to the number of patients who responded to the survey, in relation to the total number of patients in the sample. 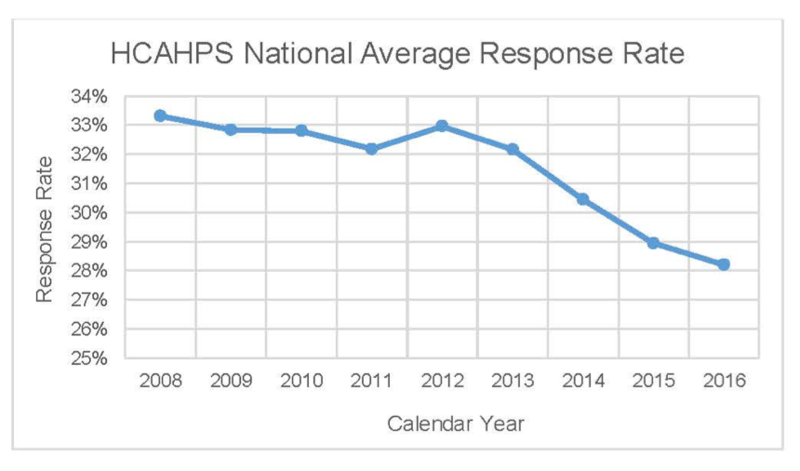 A quick review of HCAHPS publicly reported data shows the national average response rate has dropped since the initial program implementation. The average response rate in 2008 was 33%, compared to 28% in 2016. The decrease in response rate shows that today’s hospitals are receiving valuable feedback from a smaller percentage of their total population. Why worry about response rate? CMS stressed the importance of response rate to measure reliability in their April 2018 podcast highlighting ways to improve response rates. The Hospital Quality Institute (HQI), California HCAHPS Improvers Playbook identified a relationship between California hospitals’ response rates and HCAHPS scores. 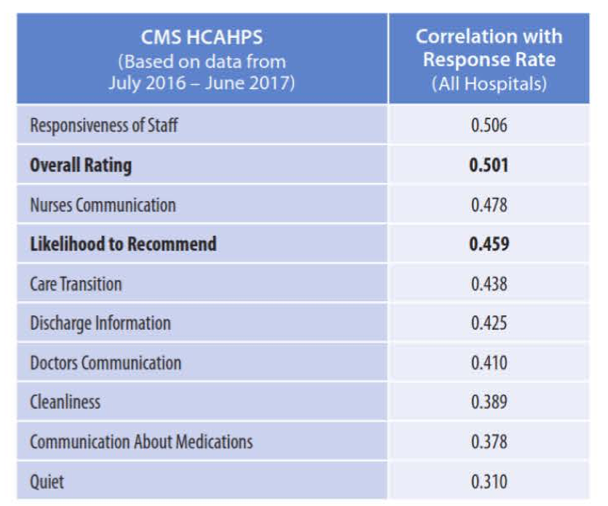 In addition, a nationwide in-depth analysis of the July 2016 - June 2017 publicly reported HCAHPS data found a correlation between all HCAHPS dimensions and response rate. This table shares the correlations found in the nationwide analysis of Hospital Compare data. A correlation value is a number between -1 and 1. A positive relationship indicates that when one variable increases, the other measure is likely to increase as well. As you can see in this table, correlation values range from .310 - .506, exhibiting a moderate-positive relationship. As a practical application, for every in 1 point increase in response rate a hospital achieves, the hospital could expect to see an increase of .501 in their Overall Rating score. With the possibility of all HCAHPS dimension scores increasing in relation to response rate, this has the potential to impact Value-Based Purchasing (VBP) reimbursements as HCAHPS dimension scores are associated with VBP points and Medicare reimbursements. These values surprise even the most astute industry leaders; this relationship would be unlikely if feedback was received from a truly representative sample. Just as an increase in response rate is correlated with an increase in dimensions scores, the converse has been found—when response rate decreases, dimension scores tend to decline as well. This research suggests hospitals with low response rates may not be getting the best representation of their total population, negatively impacting their HCAHPS scores. With recent research in mind, it’s critical that hospitals consider the importance of response rate to capture the true patient experience at their facility. Increasing and maintaining response rates allow a hospital to receive patient feedback on topics that matter most to patients, and allow for more accurate score in HCAHPS dimensions. 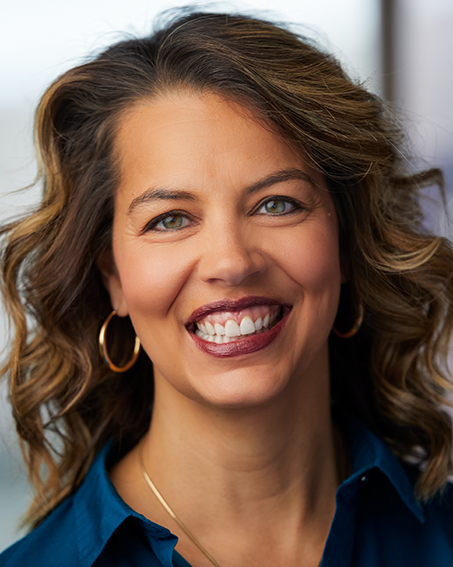 Since joining PRC in 2000, Hope has applied her expertise in statistical analysis, physician studies, and patient experience to help clients use data to improve customer service and achieve market leadership. She is recognized as a leading consultant to hospitals and health systems seeking to leverage best practice models to maximize Hospital Consumer Assessment of Healthcare Providers and Systems (HCAHPS) scores. Her skills in executive training and physician engagement, and her deep-seated knowledge of multiple product lines, round out a broad base of experience that has enabled her to contribute significantly in a number of key roles at PRC. Hope earned a Bachelor of Science degree in Biology from Trinity University in San Antonio, Texas. So what is your recommendation as to the response rate we should be aiming for? Is there a sweet spot? Thanks for the question, Susan! The correlation between scores and response rate falls off for organizations who reach a 40 percent response rate or higher, which indicates that 40 percent would be the target response rate for HCAHPS. Unfortunately, the publicly reported data shows that the average response rate for hospitals has been dropping in recent years. As a result, the real improvement hospitals are making in patient experience could be masked by the measurement. If you are interested in how your organization is being impacted by your response rate, let me know. I'd be happy to pull the numbers.